Human error in medicine does exist and is a profound challenge. When seeking to solve any problem, the problem must first be described and the factors contributing to it be identified. Laboratory testing, a highly complex process commonly called the total testing process (TTP), is usually subdivided into three traditional (pre-, intra-, and post-) analytical phases. The majority of errors in TTP originate in the preanalytical phase, being due to individual or system design defects. Quality indicators represent valuable tools for quantifying the quality of selected aspects of care by comparing it against a defined criterion. Although in many countries, accreditation is mandatory for laboratories. In India, private laboratories volunteer for accreditation mainly to meet commercial requirements. Government laboratories are far behind as in our healthcare system quality is least important. Assessing the quality of medical laboratories has become increasingly important not only for pressures to reduce costs but also for the evidence of testing-related diagnostic errors. The QIs give information about the performance of a process and highlight potential areas that need further study and investigation [Table 1]. Only the analytical phase falls under laboratory control, while the pre- and post-analytic phases are the responsibility of stakeholders other than the laboratory such as the clinician, the nurse, the patient, and others involved in patient identification, data entry, specimen collection, and transport. In addition, different terms used in the literature to define errors in laboratory medicine (e.g., mistakes, blunders, defects, outliers, unacceptable results, quality failure) have negative connotations involving blame, individual failure and culpability, and even worse, pertain to studies focusing on a limited number of total testing process (TTP) steps. Taken together, these are the “reasons for neglect” for errors in laboratory medicine and should explain why the patient-centered viewpoint has been taken into account only in recent years. Most quality improvement activities begin with measurement and feedback. However, according to a famous aphorism by Albert Einstein, “Not everything that counts can be measured; not everything that can be measured counts.” Therefore, the development and the adoption of reliable QIs play a key role in projects for improving the quality of laboratory services. A consensus has been achieved on the need to assure quality in laboratory medicine according to a patient-centered viewpoint and in the TTP. This process embraces all steps from the moment the test is chosen during patient evaluation to the point when the test result is interpreted, and a clinical conclusion is developed. Therefore, in addition to the traditional pre-, intra-, and post-analytical steps, QIs should evaluate appropriateness in test request as well as the clinician reaction to the laboratory information, thus stressing the need for a closer cooperation and interaction between the clinical laboratory and the clinical world. In fact, most pre- and post-analytical laboratory errors involve some breakdown in the process, and both the laboratory and clinicians bear mutual responsibility for these errors and for developing safeguards that will prevent them. Various studies in India and abroad as outlined below have derived benefit from these quality improvement processes. In a study from India, out of all laboratory problems, up to 61% are associated with the preanalytical phase in the laboratory. 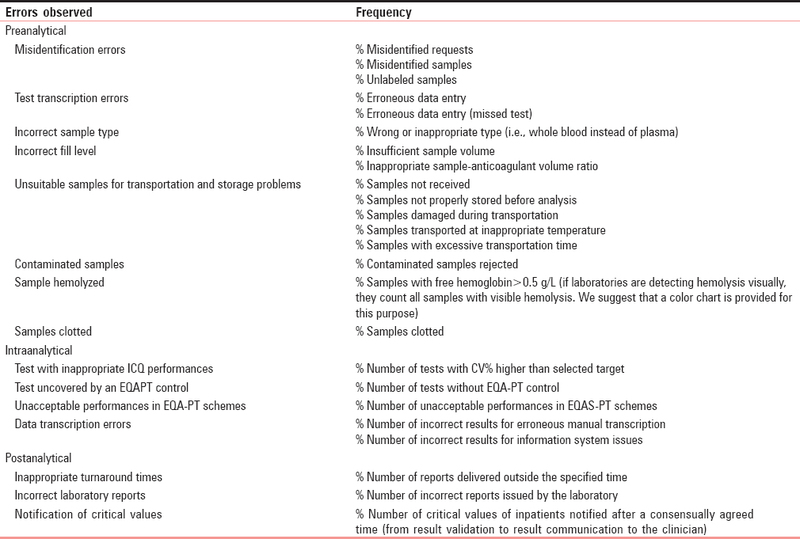 Out of this, 33% of the errors are associated with the test request forms, 18% errors with sample collection in glass vials, and 3% errors associated with sample processing in the laboratory. As per quality improvement policy of the laboratory, a closed blood evacuation system (vacutainers) has been implemented for sample collection. Postimplementation, preanalytical error rate has been reduced to 48%; however, tube filling errors still remain the major problem noted. Use of QIs helped 14 pathology laboratories in five Australian States to determine errors. They had a transcription error rate of up to 39% and an error rate of up to 26% for analytical results. The worst-performing laboratory had errors (of patient identification or results of analysis) in 46% of requests. Brazilian laboratory indicators program used a web-based program containing 61 indicators categorized into three groups. Three indicators were selected as hemolysis, blood recollection, and productivity. Program brings important benefits for participants, contributing to the improvement of existing health systems in Brazil. The study by public healthcare services in Catalonia, was to identify process indicators for the three phases of laboratory activity and their corresponding quality specifications. The laboratories participating in this working group use 12 indicators for the key processes (three for preanalytical steps, four for analytical steps, and five for postanalytical steps). Laboratories produce test results that are widely used in clinical and public health settings, and health outcomes depend on the accuracy of the testing and reporting. If inaccurate results are provided, the consequences can be very significant, including unnecessary treatment, treatment complications, failure to provide the proper treatment, delay in correct diagnosis, and additional and unnecessary diagnostic testing. These consequences result in increased cost in time and personnel effort and often in poor patient outcomes. To achieve the highest level of accuracy and reliability, it is essential to perform all processes and procedures in the laboratory in the best possible way. The laboratory is a complex system, involving many steps of activity and many people. The complexity of the system requires that many processes and procedures be performed properly. Therefore, the quality management system model, which looks at the entire system, is very important for achieving good laboratory performance. Confidence building with interested parties, for example, patients, clinicians, management, accreditation bodies. QIs are an objective measure of laboratory practices. Indicators can be developed, and when these indicators are being monitored, information about deficiency in customer needs and satisfaction will be acquired. When conducting audits or evaluating laboratory records, it is important to have a goal or standard of performance. Therefore, QIs will be needed and will have an important role to play in improving laboratory performances. Mainz J. Quality indicators: Essential for quality improvement. Int J Qual Health Care 2004;16:i45-50. ISO 15189:2012. Medical Laboratories – Requirements for Quality and Competence. Geneva, Switzerland: International Organization for Standardization; 2012. Epner PL, Gans JE, Graber ML. When diagnostic testing leads to harm: A new outcomes-based approach for laboratory medicine. BMJ Qual Saf 2013;22 Suppl 2:ii6-ii10. Plebani M. The detection and prevention of errors in laboratory medicine. Ann Clin Biochem 2010;47(Pt 2):101-10. Plebani M, Sciacovelli L, Marinova M, Marcuccitti J, Chiozza ML. Quality indicators in laboratory medicine: A fundamental tool for quality and patient safety. Clin Biochem 2013;46:1170-4. Singla P, Parkash AA, Bhattacharjee J. Preanalytical error occurrence rate in clinical chemistry laboratory of a public hospital in India. Clin Lab 2011;57:749-52. Khoury M, Burnett L, Mackay MA. Error rates in Australian chemical pathology laboratories. Med J Aust 1996;165:128-30. Shcolnik W, de Oliveira CA, de São José AS, de Oliveira Galoro CA, Plebani M, Burnett D. Brazilian laboratory indicators program. Clin Chem Lab Med 2012;50:1923-34. Kirchner MJ, Funes VA, Adzet CB, Clar MV, Escuer MI, Girona JM, et al. Quality indicators and specifications for key processes in clinical laboratories: A preliminary experience. Clin Chem Lab Med 2007;45:672-7. Laboratory Quality Management System: Handbook. WHO Library Cataloguing-in-Publication Data. Available from: http://www.who.int/ihr/publications/lqms_en.pdf. [Last cited on 2017 Apr 07].